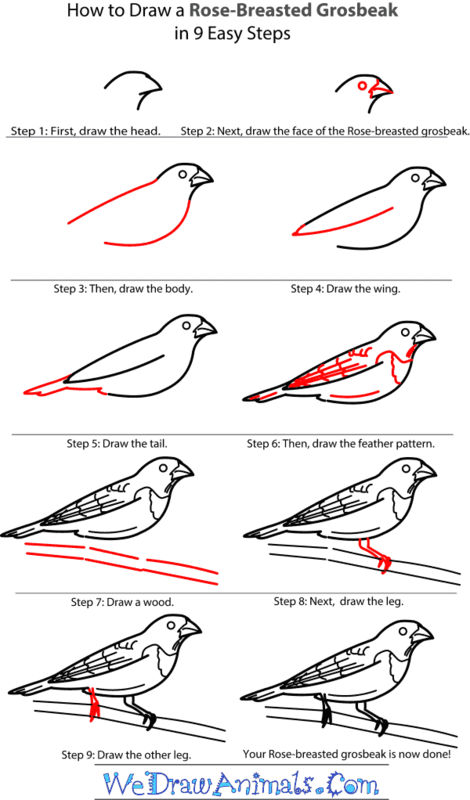 In this quick tutorial you'll learn how to draw a Rose Breasted Grosbeak in 9 easy steps - great for kids and novice artists. At the bottom you can read some interesting facts about the Rose Breasted Grosbeak. Step 1: Let us start by drawing a sideways V-shape for the beak. 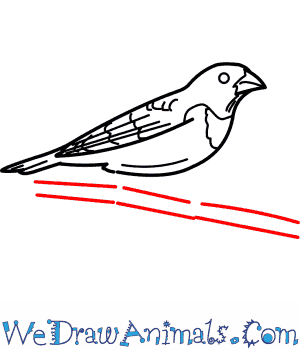 Draw curved lines to show the rounded head of the Rose-Breasted Grosbeak. Step 2: Draw a small circle for the eye of the Rose-Breasted Grosbeak. 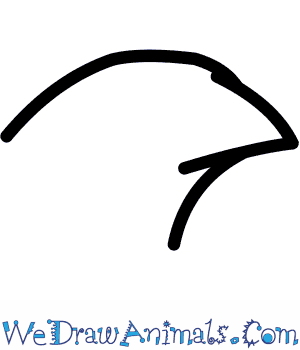 Draw the outline of the beak using a small, jagged line and then draw a line down the beak to show its separation. 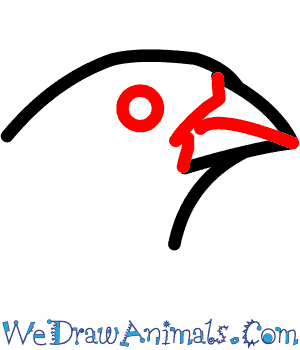 Step 3: Starting from the base of the head, draw a slanting line for the back of the Rose-Breasted Grosbeak. Then draw a curved line to complete the body of the bird. 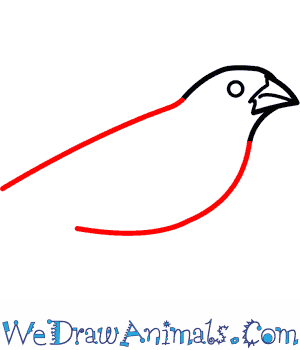 Step 4: Draw a curved line for the Rose-Breasted Grosbeak's wing. 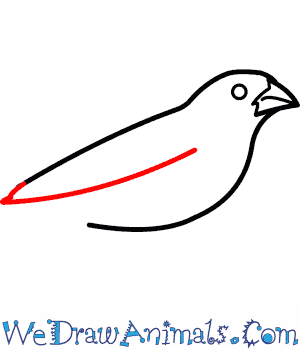 Step 5: Starting from the body, draw the tail of the Rose-Breasted Grosbeak using slanting lines and curved lines. Step 6: Draw slanting lines down the wing and tail of the bird to show the outlines of the feathers. Draw small curved lines on the neck and body of the Rose-Breasted Grosbeak. 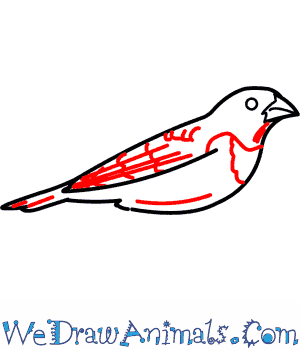 Draw the chest markings of the bird using curved lines and wavy lines. 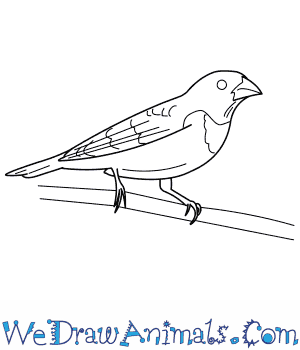 Step 7: Draw six slanting lines to show the tree branch on which the bird is sitting. Leave small, blank spaces between the lines to draw the Rose-Breasted Grosbeak's claws. Step 8: Draw two bent lines for the leg of the Rose-Breasted Grosbeak. Draw the three arched toes of the bird using small, curved lines. Step 9: Draw two, small slanting lines for the other leg of the bird and draw the three arched claws. 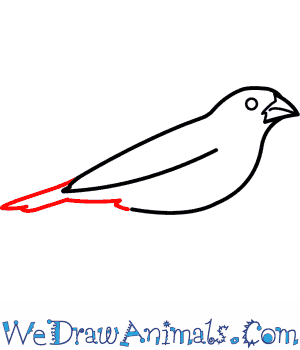 Now that your drawing of the Rose-Breasted Grosbeak is complete, you can color it. The Rose-Breasted Grosbeak is a species of songbird that lives in United States, Canada, Mexico, Central Mexico and the Caribbean. A female Rose-Breasted Grosbeak is colored in different shades of brown, tan and cream to blend in with the trees and leaves of the forest. A male Rose-Breasted Grosbeak, when it is breeding season, has a bright red patch on his chest that almost looks like a bib. His belly is a clean white, and he has white patches on his wings and tail; the other parts of the male are black. During wintertime, the Rose-Breasted Grosbeak lives in tropical regions of North and Central America. Rose-Breasted Grosbeaks eat insects that are destructive to crops; they help us out! The life-span of a typical Rose-Breasted Grosbeak is about nine years. A fledging (baby) Rose-Breasted Grosbeak can leave the nest in as few as nine days. Both male and female Rose-Breasted Grosbeaks have big, sturdy beaks. This is how they get the name “grosbeak.” They use these big beaks to glean food like insects, seeds and fruit from trees and other places. The Rose-Breasted Grosbeak is not currently in danger of extinction.